Dog Meat Trade in the Philippines: How Did It Start? What you are about to read is revolting to say the least. Unfortunately, I could not think of any other manner wherein I could get our message across, other than to give you the low down of the cold and hard facts of the present situation. You may not have been aware of the situation until now; we, on the other hand, are right in the center of this vicious activity and could no longer turn a blind eye to this expanding trade. Man, despite all his malicious and ruthless ways, is not subjected to such acts our dogs–innocent, loyal and trustworthy, endure in the hands of some men; and I could not fathom how some men could bare to hurt these noble creatures. Together with our dedicated members and the support of a lot of people who truly care for the plight of dogs everywhere, and keeping in mind, that these dog meat traders are a divided few, we are optimistic in our goal to totally eradicate the dog meat trade in the country. However, the task ahead is not an easy one. We do realize that what has taken over twenty, horrid years to evolve could not be abolished overnight. Liberally speaking, our estimates indicate that the fight may take at the most three long years, given the generally prevalent corrupt Philippine law enforcement and judicial system. But rest assured our determination and perseverance will not waver. Needless to say, the fight to save the dogs would entail more than stopping the traders. It is our intention to make every agency concerned aware of the plight of dogs in the country and be vigilant in this cause. Also, it is our commitment to not only save but care for the dogs recovered in the process. I am certain we are not alone in this vision and appreciate whatever help you could extend for our cause. I believe the more people know about this, the greater the chances these caged creatures have of surviving. For more information on this matter, more particularly on the operational aspect and the funding requirements on how we intend to permanently put a stop to this. The dog meat trade in the Philippines evolved into a commercial venture in the past 20 years. By commercial venture we mean, dog meat is openly sold at various public wet markets; dog meat is in the menus of various eateries and restaurants; and live dogs are openly butchered in slaughterhouses (albeit, illegally operating). Before its commercialization, the natives of Baguio City, and the rest of the Cordilleras (the various Igorot tribes), have been eating dog meat. This practice has a spiritual significance. In their belief, when bad luck strikes in the family, or in the clan, the family dog should be sacrificed, and the family members should partake of the dog meat. The significance of the practice is that the spirit of the sacrificed family dog, being their guard dog, will also guard and protect the souls and spirits of the living members of the family. The family dog should also be sacrificed when a member of the family witnesses a murder or an accident. The practice, called “Begnas” by some of the Cordillera tribes, is now seldom being done. With the passing of time, when more and more members of the family or the clan are faced with more bad luck and accidents, and the family did not have enough family dogs to be sacrificed, some people resorted to buying their neighbor’s dogs, thus the start of the commercialization. Others claim that dog meat eating has become a culture among Igorot tribes (although the Ilocanos from the Ilocos provinces also eat dog meat). However, a lot of Igorots refuse to accept this, as a lot of them also do not eat dog meat, and are themselves dog lovers. Dog meat eating has just become so popular starting in the 80’s (especially among the drinking crowd) when restaurants serving dog meat dishes started to sprout in Baguio City. Despite the passing of Republic Act 8485 (otherwise known as the Animal Welfare Act) in 1998, making the dog meat trade illegal, the dog traders still continued with their trade. The dog slaughterhouses, the restaurants serving dog meat, still continue to operate, and dog meat are still sold in public markets. Several factors contributed to the growth of the illegal dog meat trade in the Philippines. One is the economic slump in the Philippines and in the Asian Region in general. Another is the increased demand for dog meat. Still another is the low cost of dog meat. In the Philippines, almost every family has a dog or two as guards and pets. Raising dogs is not actually burdensome to a Filipino family as the dogs subsist on the family’s table scraps. Dogs easily reproduce, so that stray dogs are in abundance in the country. The dog population continues to grow. Spaying/neutering is still not a common practice in the country. Dog owners in the lower economic strata cannot afford to go to a veterinarian for spaying and neutering. Thus the concerned government offices just have to continue with their daily catching of stray dogs, and placing them in crowded dog pounds. At this point, it is unrealistic to expect the Philippine government to be able to do something to improve the conditions of the country’s dog pounds. Dog adoption (for stray dogs) is not common in the Philippines, as most often, those who may want to raise dogs prefer to get a puppy, than an adult one, more so a stray. The demand for dog meat in the open market continues to grow. One reason for the high demand is the low selling price. Compared to pork or beef which is being sold at (Php105.00 to Php150.00 (US$2.1 to US$3.001) per kilogram respectively. Dog meat can be bought for as low as Php65.00 (US$1.30) per kilogram. Restaurants and eateries serving dog meat also offer dog meat dishes (as their specialty dish!) for a lower price compared to other dishes. An observation is that those who frequent the restaurants and eateries serving dog meat are the drinking crowd. 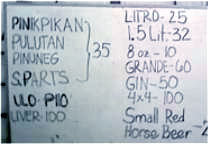 Dog meat is being served as pulutan (appetizers) and served with beer or hard drinks. For a frequent drinker, they can save by having a dog meat dish. And why is dog meat priced low? It is because the traders have minimal capital for live dogs, and because of the ready supply. Dogs being sold at Baguio City and Cordilleras (where the market is) come from as far as the Southern Tagalog provinces, Visayas and Mindanao. Simply put, it is a matter of economics vis-à-vis an evolved supply and demand situation brought about by low supply cost. Fact No. 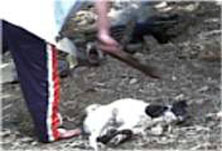 1 – Dog meat is openly traded in Baguio City and the Cordilleras in the Philippines. Around a hundred eateries and restaurants in the area are openly serving dog meat to their customers. Uncooked dog meat is openly sold in the wet markets at Php65.00 (US$1.40) per kilogram. Fact No. 2 – The supply of dog meat comes from all over the country. 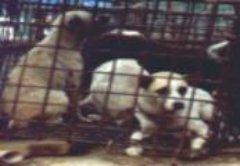 Live dogs are being transported by land, kept in cramped cages (most often, their muzzles are tightly tied to prevent them from making noise), bearing the heat of the sun for days, until they reach the illegal slaughterhouses located in various areas in Baguio City and the Cordillera provinces. Those that cannot bear the ordeal die along the way, and most often, end up “double dead”, as some unscrupulous traders butcher even the dead dogs and pass them on to unsuspecting customers. Fact No. 3 – The suffering of dogs continue up to their last breath. Below is the sequence of the brutality they are subjected to. b. Using a sharp knife, the butcher slashes the dog’s throat, making sure to hit the dog’s jugular vein, and lets the blood ooze out. The blood is collected in a bowl, as this is also sold. 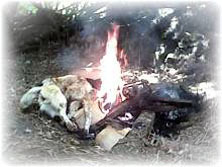 c. The dog’s body is then placed over the fire to burn its fur. e. Depending on the request of the customer(s), the dog carcass is sold in whole, with just the intestines removed and cleaned; or, the butcher chops the body and sells it retail (by the kilogram) at the public markets. Fact No. 4 – The Philippines, in February 1998, passed Republic Act 8485 otherwise known as the Animal Welfare Act, but this law is being poorly implemented. One reason for the poor implementation is that some, if not most of the top local officials themselves are dog eaters. The illegal dog meat trade has developed over the last 20 years into huge trade. There has been no political will for its active eradication and implementation of the law. In the Philippines, unless there is a complaint, and enough logistics, the law enforcers will not move. Fact No. 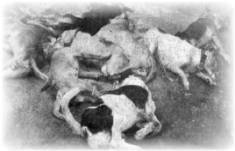 5 – In Baguio City the dog pound dispose of unclaimed/captured stray dogs through public bidding. However, anyone (even the dog traders and dog eaters) can join and buy the dogs, as the dog pound does not bother to determine the purpose of the buyers. They just don’t care even if the dogs end up in dog slaughterhouses. Another disturbing fact is, just beside the dog pound, is a place where some traders butcher dogs. 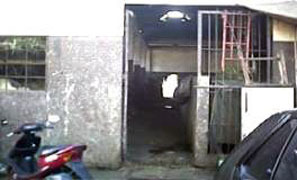 The facade of the slaughterhouse beside the City Veterinary Office(left) and the City’s Dog pound (right), where some unscrupulous individuals have the dogs [bought from the pound] butchered. Seen in the right photo is the distance between the City Veterinary Office [which is on the left side] and the slaughterhouse [on the right side]. It is estimated that around 290,000 dogs are being killed for food in the Philippines every year. This is translated to approximately 174 Million Pesos (or US$3.8M) a year worth of livelihood and industry for those involved in the dog meat trade. Already on its third decade, and with the support and patronage of local officials, this illegal trade cannot be stopped overnight. With the passing of the Animal Welfare Act in 1998, there is now a law in which to base the prosecution of those who maltreat animals (for our purpose, dogs). Section 6 of the law, prohibits killing of dogs, except on 7 grounds, among them for religious purposes. Implementing the law is also easier said than done. It is a fact that there are many laws in the Philippines that are being taken for granted or are not being implemented at all. The Animal Welfare Act, which is relatively new in the country, is one of them. In Baguio City and La Trinidad (Benguet) alone, there are around 60 restaurants, eateries and canteens serving dog meat. These are located all over the city including the central business district, and are being patronized by no less than the local politicians, heads of government offices, policemen, and even professionals. In the Baguio City public market, 3 stalls in the meat section were found to be selling dog meat. While three vendors were arrested on June 23, 2003 through the initiative of a lady expatriate, Blythe Reed, the selling still continues and the arrest did not have a deterrent effect at all. In La Trinidad, uncooked dog meat is also being sold in a meat store just below the Provincial Capitol. This is aside from several food outlets (eateries) serving dog meat dishes. Compared to other laws (like the anti-gambling law, the anti-piracy law, etc.) the law enforcers do not conduct specific operations for the implementation of the Animal Welfare Act. Since the passage of the law in 1998, most of the raid and apprehensions were initiated by NGOs (non-government organizations). The Regional Traffic Management Office (RTMO)–Cordillera (formerly known as the Traffic Management Group), which is a branch of the Philippine National Police (PNP) in a few instances, while in the performance of their routine vehicular checks encountered dog traders in their attempt to transport dogs to Baguio City and Benguet province. The Criminal Investigation and Detection Group (CIDG), another branch of the PNP, has been tapped by a non-profit group, the Political Animal Lobby (PAL) to implement the law. There were also a few instances when the CIDG in Camp Crame (PNP Headquarters), by chance, had encountered and apprehended dog traders en route to Baguio City and Benguet. Furthermore, the Special Operations Group - Jericho, of the Department of Interior and Local Government (DILG), whose main function is to enforce the anti-illegal gambling law, has also been tapped by another non-profit group, the International Wildlife Coalition (IWC)- UK, which later on formed a local group with the name Animal Kingdom Foundation to perform the same function. Linis Gobyerno, on the other hand, in their independent drive against the dog meat trade preferred to coordinate with the National Bureau of Investigation (NBI), which is under the Department of Justice (DOJ). The experience of an expatriate with the Baguio City Police Office of the PNP, is very disheartening. Ms. Blythe Reed*, on May 2003 had seen for herself the blatant selling of dog meat at the city’s public market. Right then and there she proceeded to the Baguio City Police Office, which is located within the vicinity. While reporting the incident, a policeman told her that Baguio City is exempt from the Animal Welfare Act. But when Ms. Reed asked the police to show her where in the law does it say that Baguio City is exempt, the police said that he has not read the Animal Welfare Act yet. She related that the policemen were taking the issue as a laughing matter. By June, Ms. Reed went back to the police, armed with a copy of the Animal Welfare Act which she has downloaded from the internet, and demanded for the arrest of the people selling dog meat at the public market. Despite the arrest, as of August, 2003, the dog meat selling in the public market still continues. * ( Blythe Reed is an American living in Baguio City. Another disheartening fact is that the location of the illegal dog slaughterhouses, the selling in the public market, and the presence of restaurants serving dog meat is an open knowledge in Baguio City and La Trinidad, Benguet. As a matter of fact, one identified dog slaughterhouse located at Camp 6, Tuba, Benguet, is very near a police outpost. There were information that the said slaughterhouse is actually owned by a Police Colonel. The members of the police force are among those who patronize the joints serving dog meat. Now in its 6th year, there is no serious implementation of the law. From 1998, the records of the Prosecutor's Office of Baguio and Benguet reveal a total of 19 cases of violation of the Animal Welfare Act in Baguio City and Benguet Province, 5 of which were filed before the Baguio City Municipal Trial Courts (MTC), 8 cases before the La Trinidad Municipal Trial Court (MTC), and 6 were filed before the Sablan-Tuba Municipal Circuit Trial Court (MCTC). The cases involved a total of 37 respondents, some of them, 7 are repeat offenders. On the other hand, of the 19 cases, 3 were dismissed; the respondents in 12 of cases entered a plea of guilty upon arraignment (thus were convicted); while the rest of the cases are still undergoing court trial as of August 15, 2003. The cases stemmed either as a result of a raid, or the respondents were apprehended by chance while in the act of transporting dogs. Of all the cases, only 2 have private individuals as complainants. The first one was the one filed by Linis Gobyerno members, headed by its Executive Director, Freddie J. Farres; and the other was the one personally filed by Ms. Blythe Reed. Both cases are being heard before the Baguio City MTCs. Despite all the arrests, and raids conducted, the dog traders did not budge. It appears that these police operations seem to have little deterrent effect. As a matter of fact, the arrest and apprehensions, can become a source of corruption among the police and the judiciary. Further, the dog traders would rather enter a plea of guilty. Doing so, they will just be meted a fine (minimum penalty), which would cost less than hiring a lawyer to defend their case. And while some were already convicted or have cases on going, the traders are back to their usual business. 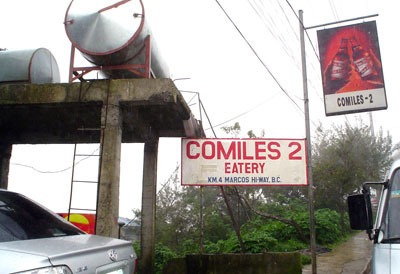 The Comiles Restaurant (which operates a chain of dog serving restaurants), for example, was not affected at all by the on-going case they are facing). The slaughterhouses, on the other hand, who are more careful now, are still operating, violating several other laws, other than the Animal Welfare Act. The Local Government (from the barangay up to the municipal, city, and provincial level) has a big role in the proper implementation of the Animal Welfare Act. This is contrary to the common notion that law enforcement is left in the hands of the police. On July 14, 2000, the Department of Interior and Local Government (DILG) under then Secretary Alfredo Lim, issued Memorandum Circular 2000-91 directing all Local Chief Executives “to undertake concrete steps to help promote and support animal welfare in their jurisdictions”. Despite the law and the DILG’s directive, Baguio and the rest of the Cordillera region are yet to craft their local version of the Animal Welfare Act. Baguio City, as far back as 1934 has already come up with an Ordinance (Ordinance numbered 500-34) in relation to animals (some provisions of which are the prohibition of animals in public places, the establishment of animal pound, and penalties). There are provisions, however, in this ordinance which are no longer applicable, (as a matter of fact, most of it are not being implemented) thus, in 2000, the Baguio City Council amended the said ordinance particularly that which concerns dogs. This led to the creation of Ordinance Numbered 025 series of 2000. While this Ordinance can be said to be good enough, it did not take into consideration the newly passed law in 1998, the Animal Welfare Act. It does not prohibit cruelty, and dog meat eating. As a matter of fact, the said Ordinance allows euthanasia, whereas the Animal Welfare Act did not specify whether euthanasia is allowed. It only mentioned of “the most scientific method” of killing animals, which is “to be determined by the Commission on Animal Welfare”. As of 2002, the Department of Agriculture, which is supposed to head the Committee on Animal Welfare said that it has not determined yet what that “most scientific method” is. This City Ordinance also transferred the operation of the Dog Pound, from the police to the City Veterinarian. The Ordinance required for the dog owners to register and tag their dogs. However, only the portions which provide for the catching of stray dogs, collection of impounding fees and allowing the sale of dogs thru public auction, are the ones being implemented. 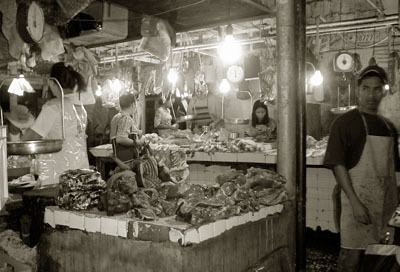 In 1991, the City Council, through the motion of then Councilor Mauricio Domogan (now Congressman), in a way legalized the selling of dog meat in the city. This is through the Ordinance Numbered 69 series of 1991 entitled “An ordinance amending Ordinance No. 104 series of 1949, regulating the business of dealing in dogs and the sale of meat thereof in the City of Baguio”. This Ordinance, is still not amended or repealed. Although there is no designated area for the selling of dog meat in the City Market, 3 or 4 stalls in the meat section are openly selling dog meat, with valid business permits at that. The local government of the province of Benguet is slowly coming up with their own version of the law. In May 3, 2003, the Municipality of Tuba came up with their Municipal Ordinance No. 08 series of 2003 requiring all dog owners to have their dogs vaccinated. As Tuba is the first municipality of Benguet in which dog traders will have to pass through in going to Baguio City and Benguet’s capital town, La Trinidad, the same ordinance requires that dogs and animals being transported or shipped thru any point of their municipality should be in cages with ample ventilation and space. In Barangay Pico of La Trinidad, Benguet, on July 12, 2003, they came up with Barangay Ordinance Numbered 05 series of 2003, also requiring all dog owners to have their dogs vaccinated. It also requires proper dog management and humane treatment of dogs as provided for in the Animal Welfare Act of 1998. In all the existing local laws, they do not specifically prohibit dog eating. And while the DILG specifically mandates the local government to apprehend and prosecute those engaged in the illegal trading of animals (dogs included), we have not heard of local government efforts to implement this directive. Worse, the local government leaders are themselves patronizing the joints (restaurants) serving dog meat, and even give them business permits. In the Philippine setting, the non-government organizations (NGOs) have a very important role to play. It is a fact that corruption is embedded in the Philippine government system. It is also a fact that the government is cash-strapped so that the private sector (the non-profit organizations) have to fill in the gap. The NGOs then are left to do the functions that the government cannot accomplish. One is the implementation of the Animal Welfare Act. While the government has all the resources for it- politics, corruption, and lack of interest hamper the full implementation of the law. NGOs help and pressure the concerned government agencies to do their job. In relation to the Animal Welfare Act, 4 groups are known to be operating for its implementation. The first one to come in is a foreign group, the Political Animal Lobby (PAL). This was followed by the International Wildlife Coalition of the United Kingdom (IWC-UK). Then the local group (Baguio City based) Linis Gobyerno, Inc. came in; which was followed by another local group (Manila based), Animal Kingdom Foundation, which is an off-shoot of the IWC-UK. The Philippine representative of PAL, (a UK based organization) claim to be operating in the country even before the passage of the Animal Welfare Act. However, records obtained indicate that the group started helping in the implementation of the Animal Welfare Act on September of 2000, three years after the creation of the law. While there were arrests done by local police on traders transporting dogs, PAL started the raid on slaughterhouses. However, their first job was highly criticized because they (together with tapped law enforcers) allegedly did not observe the rules during the raid. It was alleged that they swooped into the known dog slaughterhouse, armed with cameras and media in tow, and without a search warrant or warrant of arrest, arrested a person who was not caught in the act of slaughtering a dog. They even implicated a person who was not at the place at that time. This was the first case filed before the La Trinidad MTC. It was dismissed. Locals perceived PAL’s actuation as a move “for show”. The group became active again in the year 2002. This time, they were more cautious and careful. However, it was observed that they are just concerned with highly publicized arrests. The group, after the arrest, turned over the dogs to the already crowded Baguio City Dog Pound, and their job ended there. They are not involved in the prosecution, they do not exert effort to see through the welfare of the recovered dogs. In an interview with the Baguio City Veterinarian Brigit Piok, who manages the dog pound, said that PAL, every time they turn over dogs, make it a point to donate soap, disinfectants, rice and sardines. She however cannot quantify the donations. This makes the locals wonder why PAL gives rice and sardines, and not dog food and some vitamins and medicines for the sick dogs. Are the donations meant for the dog pound staff and not for the dogs? Why give sardines to the sick dogs? This may just worsen their already failing health. While the City Veterinarian also claims that PAL helped fix some cages in the dog pound, again, she cannot quantify the “help” extended. Further, PAL or any of its representatives never came forward to be the complainants in the cases filed against the dog traders they have apprehended. Simply put, they left the law enforcers in the cold, that is, after they got what they wanted – photos and video footages of the grim situation of dogs at the time of the arrest. It is also a wonder why PAL, a well-funded group did not care to put up a dog shelter for the recovered dogs. Still, it is also a wonder why PAL, a known lobbyist, does not push for the amendment of the law for stiffer penalties, and push for the immediate creation of the Committee on Animal Welfare as provided for in the law. Surely, these are easy stuff for them. But why are they not doing it? Are they really serious in putting a stop to the trade? Or are they just using the Philippine situation for their “campaign” in the US and Europe? This is the second foreign group that tried to make use of the Philippine situation to solicit funds. It is this group, headed by Charles Wartenberg, which initially hired The Junction newspaper and Linis Gobyerno to conduct a research on the dog meat trade situation. At first, we thought Mr. Wartenberg was for real. However, his real color surfaced when he unceremoniously started killing the recovered dogs, disregarding existing Philippine laws and rules. This group did not gain ground, as The Junction and Linis Gobyerno did not hesitate to file a case against Wartenberg and his cohorts for the violation of the same law which they claim to be implementing. This is an off-shoot of the IWC-UK. It claims that it is a local group, (being locally organized). However, it is formed by the very same group composed of the IWC-UK in the Philippines. Mr. Wartenberg is part of them, and allegedly still the one calling the shots. The system being used by this group is very similar to that of IWC-UK. Though they do not kill the dogs, they do not turn them over to the nearest dog pound either. Also, evidences are not turned over to the local courts and authorities. A bit high handed at that. And like PAL, they are not actively involved in the prosecution. And again like PAL, leave everything to the government after they get photos of the grim plight of dogs in the country. Linis Gobyerno started with this advocacy when the group was hired by IWC-UK. It was then that our eyes were opened to situation and the sickening truth. And while the above mentioned groups are active in the raids and arrests, Linis Gobyerno took the other route. While arrests may have a big impact to donors with a heart for dogs, Linis Gobyerno decided to take things in stride, to comprehensively approach the problem, and immersed themselves in the community where the problem is at its worst. Linis Gobeyrno decided to embark on proper research documentation, information dissemination, lobbying, and practically filling in the gap left by the government and the other groups. Linis Gobyerno decided to start on a dog shelter, actively monitor the cases filed, and exert some pressure on the judges and government prosecutors and the local officials to do their job. Arresting the offenders is among the easiest thing to do, and the most dramatic one at that. Yet, what comes after is the bigger problem. What do you do with the dogs? How do you make sure they won’t end up back to the slaughterhouses?